The exclusive gaming chairs from noblechairs possess a range of ingenious orthopaedic innovations that result in an incredibly comfortable seated experience. Their gaming chairs succeeded in blending premium design with high-quality materials along with superb craftsmanship - but they were missing just one thing. Enter: The noblechairs footrest. This builds on the already excellent comfort of a gaming- or office chair with a footrest that offers a contact area which can be adjusted by up to 57 degrees to match the angle of a recliner. As we have since come to expect from noblechairs, their premium footrests are available in a variety of different material- and colour combinations. noblechairs products are capable of achieving an optimised ergonomic seating position for a wide variety of shapes and sizes, helping to achieve a more dynamic seated experience for owners. This dynamism is what helps the body remain comfortable over long gaming sessions, and this is partially thanks to the improved posture and blood flow the chairs allow. Combining this with an additional footrest builds on the functionality of a traditional office chair and makes it into arguably one of the most comfortable seating experience out there. Achieving this premium aesthetic and design is no mean feat, and is due in no small part to the reclining mechanism that can be lowered by up to 57 degrees. The integrated pivot allows the footrest to turn on its axis. In combination with the tilt mechanism of noblechairs gaming chairs, users are truly in for a treat. Note: Due to the design of the footrests, they cannot be used as a seat. More links for "Footrest - Black/Gold"
If you already own a noblechair and find yourself wishing you had somewhere to put your feet, splashing out on this footrest won't leave you disappointed, providing you can stomach the initial outlay. 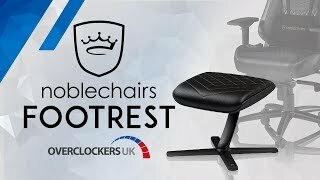 noblechairs is a premium gaming chair brand, and the quality of this product goes a long way to justify the retail price.